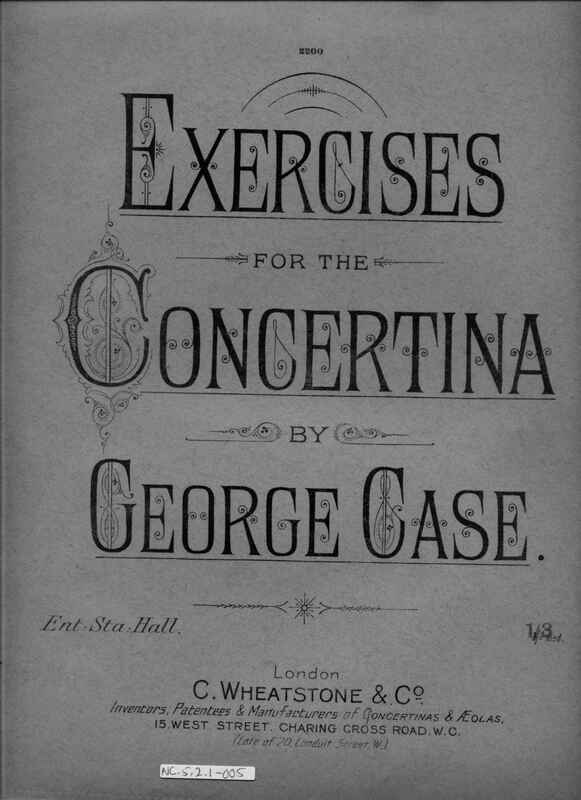 Full Description: A large folio edition of “Exercises for the Concertina by George Case”, published by C Wheatstone & Co (late of 20 Conduit St, W), numbered 2200. A later reprint of an early piece of Wheatstone sheet music, the music itself headed “Exercises for Wheatstone’s Patent Concertina, by George Case”. The rear of the cover has a similar full-page Wheatstone concertina advert to that upon Item NC.5.2.1-004 [http://www.concertinamuseum.com/NC50201-004.htm] but now has a larger section for Æolas (“New Octagonal Model”) and for “Plated Metal End concertinas”.